Winnipeg hockey fans will have to open up their wallets if an NHL franchise is to succeed in the city. The presale season ticket drive begins at 1 p.m. today at Driveto13.com, where on Tuesday, officials with True North Sports and Entertainment outlined the pricing plans to hold the coveted tickets, based on three- and five-year commitments. True North’s president and CEO, Jim Ludlow, says the ticket prices are fair, despite what the average Winnipegger on the street may say. Winnipeg will have the third highest ticket prices in the NHL, behind Toronto and Montreal. Ludlow feels the organization will have no problem reaching its 13,000 ticket goal by June 21 — on the day the League’s Board of Governors will vote on the deal. “We will have this building (MTS Centre) sold out on a long-term basis, with long-term seat commitments,” Ludlow said. 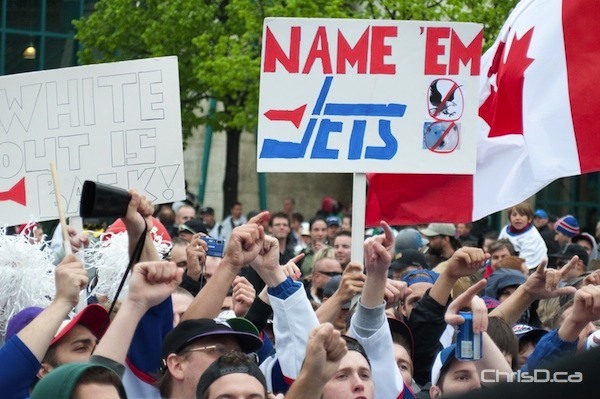 The True North honcho said the community has changed since the Jets were here, and the marketplace is more willing to support the franchise than ever before. A name for the team hasn’t been decided, and an announcement on that front is expected shortly. The public will have access to 2011-12 season ticket purchases at noon on Saturday. See what NHL Commissioner Gary Bettman and Manitoba Premier Greg Selinger had to say to reporters on the NHL’s return.